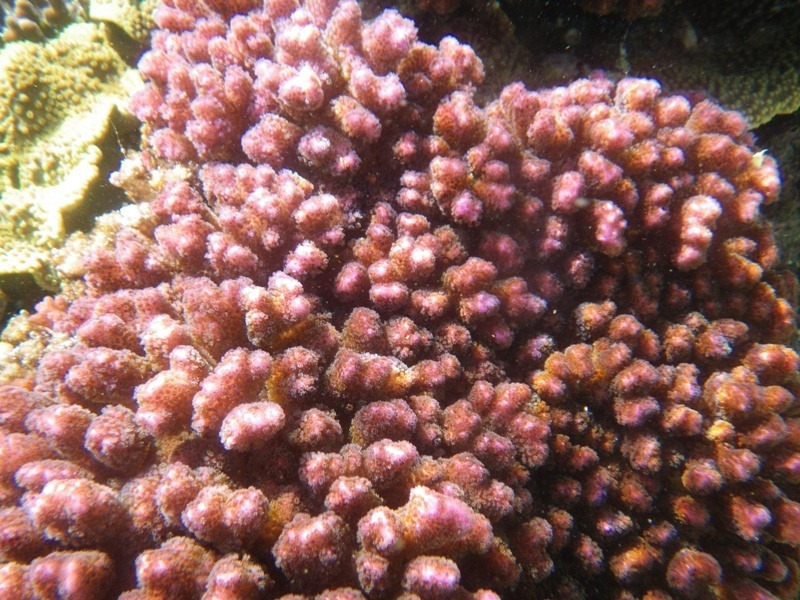 At 40 meters or less, Zooxanthellate scleractinian corals are the major specie of corals found in well-lit tropical waters where massive structures exist which provide a critical habitat for the diverse abundance of reef fish and invertebrates. 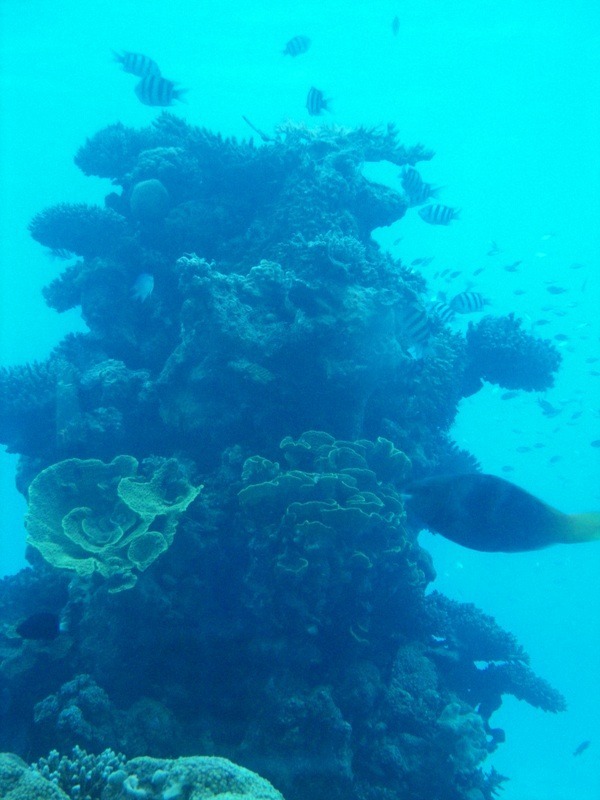 Coral structures change considerably with increasing depth which causes a decrease of Zooxanthellae. Acropora, Pocillopora and Porites are almost non-existent at depths over 40 meters where the spectrum begins to rapidly drop at 500 nanometers. Zooxanthellae have the major photosynthetic pigments chlorophyll A and chlorophyll B with chlorophyll A being greater. This along with amino acids and various nutrients and trace elements combine and serve as major light-harvesting components which in turn provide food to the coral by means of photosynthesis. The above has been proven by a study undertaken by many scientists and is available for a fee by going here; http://www.int-res.com/journals/meps/. 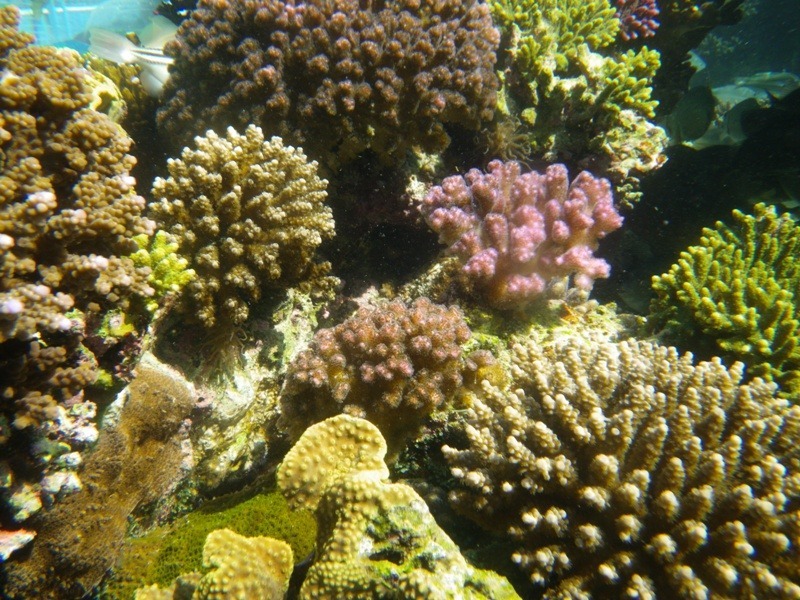 There are many species of corals found at various depths on a reef and each has adapted to the spectrum and intensity present at the depth they are found. In our aquariums, deeper water corals and/or corals coming from estuaries or turbid waters where light intensity is not as high as on pristine reef waters will likely not fare well with corals being kept which require a higher intensity of light and spectral range. This is why it is important to plan your reef carefully by choosing corals that can co-exist with the same spectrum and intensity of light. LPS corals are generally found in deeper waters or shallower turbid estuaries where many Euphyliids are found such as Elegance Corals. Both water depth and clarity have an effect on both intensity and spectrum. On clear well lit reefs ranging in depth from 1 to 15 meters, the spectrum is relatively flat from 375-600 nanometers at one meter and then gradually falls to about 55% of the surface irradiance. 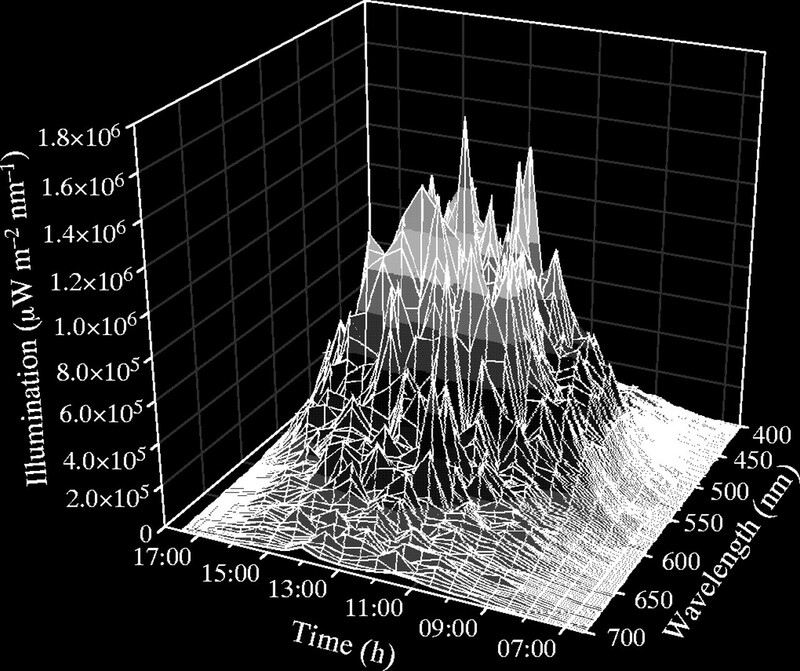 At 15 meters in depth, the wavelength falls sharply after 500 nanometers. Some corals can gather light more efficiently than others. Thin plate corals such as plating Montiporas allow light to travel through the colony and then reflect back up from the background providing more reflectance to the corals. What does this all mean to us reef keepers? It means that to provide the best lighting habitat for the types of corals we choose is to keep, the spectrum and intensity (PAR/PUR) should be close to what the corals are exposed to in their native habitat. If a mix of SPS and LPS corals is desired, care must be taken in placement so LPS corals are in an area where the light intensity is not as intense. Experienced reef keepers generally will have either a SPS or LPS dominated aquarium which makes it much easier to regulate the light and spectrum for that particular genus of corals and greatly reduce allelopathy issues. Our new Atlantik LED Pendant can be programmed to control both intensity and to tailor the spectrum for the coral species you intend to keep or propagate. There are four individual channels of light and each channel provides seven different programming points which allows for a wide range of spectral and intensity options. Based on the above, the Atlantik will allow you to program both the spectrum and intensity of the four different lighting channels to provide the most suitable light for the types of corals you will keep. For aquarists with little reef keeping experience, the Atlantik features eight pre-programmed photoperiods with varying spectrums and intensities for different types of corals and/or applications. Considering the high intensity of the Atlantik, Orphek highly recommends that you start with the “Slow Acclimation” program and then choose one of the more intense programs once the corals have adapted to this new light. Once you gain some knowledge and experience with the light spectrum and intensity and how it affects corals, you can develop your own program(s) for the Atlantik. The Atlantik is capable of storing up to three programs. Further reading is suggested and can be found here.